I'm currently working on a Half Square Triangle (HST) mini quilt made with more left over triangles from another quilt made with the stitch and flip method of block construction. These HSTs finish at 2 inches square. I had a idea about embroidering flowers, peaking out in the white patches but hidden by the colored triangles. It was an interesting idea, but when I found the designs I wanted to embroider, it made more sense just to work on the surface. 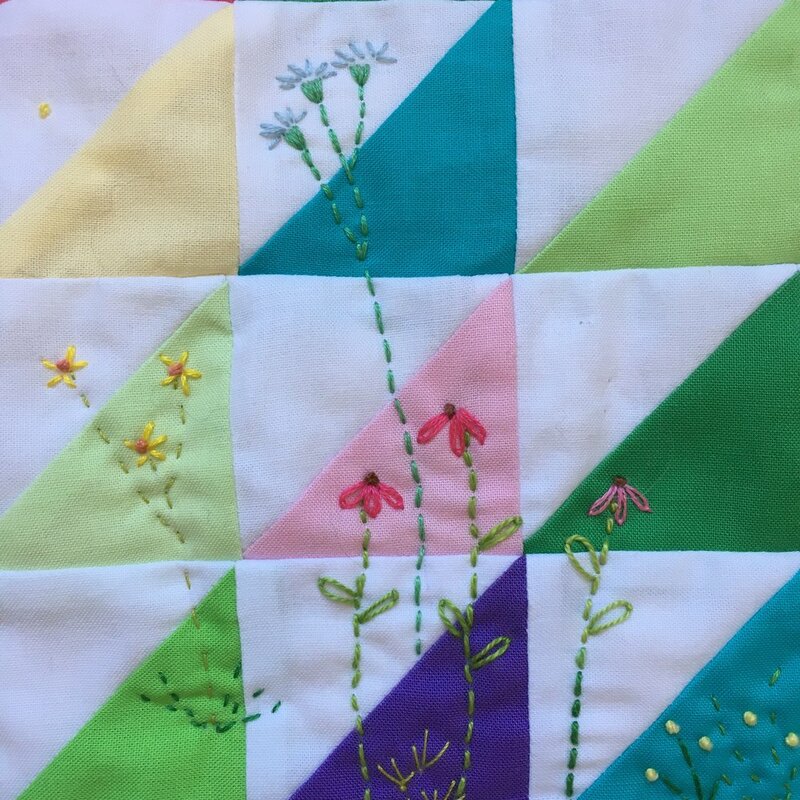 I embroidered just the flowers through the top of the quilt and the batting, saving the stems to use as part of the quilting. That worked really well. The colored threads are buried in the back of the batting and so aren't visible on the front of the piece. Here's a look "behind the scenes" on the back of the batting. I learned to embroider in school in second grade, so it's an established skill. But I decided to look around the internet to see if I could find some inspiration and new ideas. I discovered a beautiful book, The Embroidered Garden: Stitching Through the Seasons of a Flower Garden, by Kazuko Aoki. This is such a lovely book. I highly recommend it if you are interested in embroidering flowers. All her embroidered pieces are together in the front half of the book, with detailed stitching instructions in the back of the book. I drew my flowers, one at a time as I worked, with a fading marking pen, using her embroidery as a guild. I needed to redraw portions of some flowers because the pen faded faster than I could stitch! I used flowers from two of her Summer Garden pieces to make my design, but I didn't very stray far from her beautifully balanced floral compositions. My embroidery design clearly echoes hers. I'm nearly done! 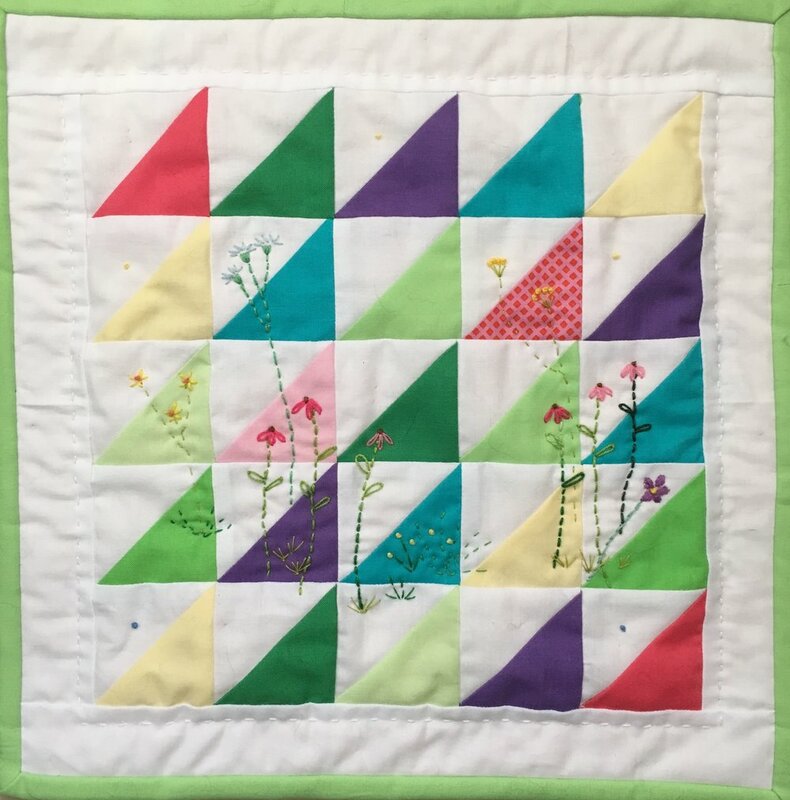 I'll show the completed mini quilt in my next post.